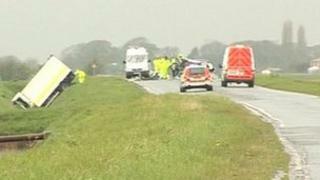 A woman has died after a collision involving a military bomb disposal vehicle in East Yorkshire. Police said the crash happened near Swinefleet, on the A161, at about 15:40 BST on Thursday, when a Royal Logistic Corps lorry and a Nissan car collided. A Humberside Police spokesman said the 51-year-old woman from Eastoft near Scunthorpe died from her injuries. The white Daf Ministry of Defence (MoD) vehicle was carrying three military personnel, one of whom was cut free. The driver of the truck, a 54-year-old man from East Yorkshire, was freed by emergency services after sustaining injuries to his hand and whiplash. A 63-year-old man from Beverley and a 20-year-old woman from Durham were also in the truck and were treated for minor injuries. The MoD said its vehicle was not responding to a bomb alert at the time.